In a shocking display of bravado, our armed forces risked reputation, operational effectiveness, and – quite frankly – a full blown international incident a week ago when they allowed something that had never been attempted before. They let a bunch of cartoonists come to Afghanistan. Cartoonists, well that’s bad enough. But to let in the guys that they did? That’s downright dangerous. And it’s not like DOD shouldn’t have known better. Most of the group had been in Iraq already (last year), so they knew what they were getting. Stephan Pastis (Pearls Before Swine), standing in front of a raw sewage outlet in Kuwait. Garry Trudeau (Doonesbury), on the chair he took with him to Afghanistan. Tom Richmond (MAD Magazine and owner of a caricature empire) – too big to make fun of. Mike Luckovich (Ed. Cartoonist for The Atlanta Journal-Constitution). The only Southwest Asia “rookie” in the group he pretty much wore this outfit the entire trip. He should have asked a few more questions before packing. 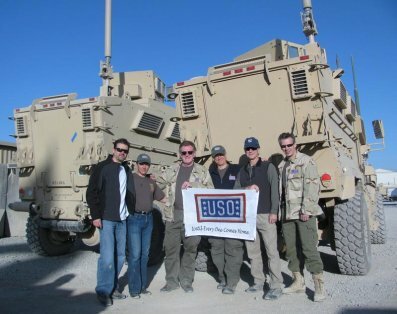 These half-a-dirty-dozen were the vanguard for others who will follow as part of a USO effort to entertain the troops in Afghanistan. If we’re lucky they will also continue sending cartoonists to Landstuhl and Iraq. The military hospitals (and several VA hospitals) in the continental U.S. will always be on our list regardless of where else we travel. 2008 Trip to Germany — Bunch of cartoonists fly to meet soldiers. Trip INCLUDES JEFF BACON. 2009 Trip to Iraq — Bunch of cartoonists fly to meet soldiers. Trip INCLUDES JEFF BACON. I guess I shouldn’t be surprised that they let these artists fly to Afghanistan because they are truly some of the top cartoonists in the world, and all of them have been huge supporters of the men and women in uniform. I am a little puzzled that they let them back in to the U.S. Nevertheless, I’m glad they returned safely. It’s interesting how a bunch of guys drawing funny pictures can accomplish something truly important. Not only do their visits lift the spirits of those who are serving, they also let them know how much everyone back home appreciates the sacrifices they are making on our behalf. For a great recap of the trip, you should read Tom Richmond’s blog (click on the picture below). Tom is famous for his detailed and entertaining narratives – check it out.